Curse you, Aaron for holding me to my promise to post daily in November! 😉 Now, I can’t possibly catch up since I’m too far behind already, but I will do my best to post more than usual for the rest of the month. Luckily for me, there’s at least a little bit of news to report, starting with the February solicit for Daredevil: Reborn #2. Skip ahead to the next section if you don’t want spoilers (I hope the text should be easy enough to avoid). I feel okay posting the cover, however, since it’s not only not the final cover (apparently), but fairly generic in that it doesn’t give the plot away. You have to wonder what they mean by “the man who would be Daredevil.” Granted, English isn’t my native language and I may be mistaken, but I always thought “would be” in this context referred to a kind of past future as in “the would be head of the sales department started his internship on this day twenty years ago.” Oh well. Just for fun, I’m also taking the opportunity to post some recent sales data for Daredevil and Shadowland (sales estimate as reported by CBR the following month, not including reprints). I have to say that I’m surprised that Shadowland hasn’t dropped more than this (it’s even gone up between issues 2 and 3). Daredevil is holding pretty steady too even though the “normal level” is lower than it was a few years ago (though this is true of virtually all regular series). Has there ever been a Marvel comic that took place in New Mexico that *did not* involve the Hulk in at least a cameo? Hopefully it is just bad writing in the solicit. 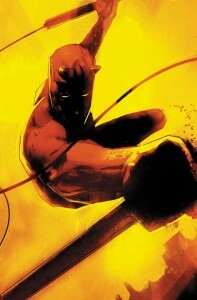 I’d like to think Marvel isn’t stupid enough to have this not be about Matt Murdock, but then again, it is Marvel. All these comics make me sad. I miss Matt Murdock from when his comics weren’t depressing attempts by the writers to see who could ruin Matt’s life more than the previous writer did. Ever since I was a kid and he was the only superhero with the same name as me, I’ve been a Daredevil fan (we’re talking since 1974). Now I can’t bear to read the comics. I do, however. enjoy reminiscing via your blog. Hey everyone! Just letting you know that I’m on my way back home from Thought Bubble in Leeds and have tons of fun stuff to talk about (as well as some things I can’t talk about) as well as some pictures to share. I land at midnight so I won’t get anything up until Monday though. Will see you again then!